Many years ago, long before I came along, my dad ran a string of gas stations in Los Angeles. He was very good at his job. He ran a tight ship. That laser-like attention to detail and exacting perfection didn’t change over the years. He demanded a lot of himself, and, by turn, everyone else. One day during those gas station years, late ’50s or so, Mickey Rooney – yes, that Mickey Rooney – came to my dad’s station. And, apparently, Mickey Rooney didn’t adhere to the “good customer” rules that my dad expected. A “Do you know who I am?” led to a “I don’t care who you are.” Rooney, the story goes, expected free service on his car, simply because he was famous. From then on, Mickey Rooney was not spoken of in our home. You’re comparing a baseball legend to this guy who picked a fight with my dad because he was expected to pay for service like everyone else? The Earl of Baltimore was a baseball genius. But, he was also a scrappy, crabby, cranky, irascible, chain-smoking, argumentative firecracker, who might be best known for all the times he tangled with umpires, kicking dirt and getting ejected from 98 games. He was a tough-as-nails perfectionist who demanded a lot of himself, and, by turn, everyone else. Kinda like my dad. Earl Weaver is, on the one hand, a big ball of everything I usually find unpleasant about the game. But, he is also a lot of what I find wonderful about baseball. He treated a baseball game like a chess match. He was loyal to his players. He demanded the best from them and routinely got it. He had no time for Prima Donnas. Before computers and spreadsheets, Weaver would have his own deeply detailed statistics handwritten on white note cards which he kept beside him in the dugout. He knew how to position his defense for any potential batter; he knew how every Oriole batted against any potential pitcher. And, it was all by pen and paper. He hated to waste outs. That’s why he hated the bunt. Wasteful and inefficient. He loved homeruns which led to runs, leaving nothing to chance. He grew tomatoes in the bullpen. Why not get a little something extra out of those far reaches of the ballpark? He became a fussy gardener. My dad became a fussy farmer. Yes, Weaver got angry a lot, blew up, yelled, and kicked dirt like a petulant child. The stories from players, umpires, and fans, are endless. Almost unbelievable. You can watch one legendary ejection here. He yelled at umpires and at his players. But, then he moved on. Every day was a new start. Close the book and start again. Focusing only on what you can control today. Being the very best at this present moment. Not worrying about the next game or the next day. This all kind of reminds me of my dad. He got angry a lot, too, especially when things weren’t exactly to his liking. When they weren’t “just so.” Especially when those around him didn’t adhere to the same high standards he set for himself. I got in the way of that exacting standard many, many, many times. But, then he would get over it. As though nothing had ever happened. And, a new day would begin. Weaver loved the game and he loved the Orioles. Maybe they’re having a smoke and a beer together in heaven. Earl can explain to my dad why baseball is the greatest game. They can argue about that for awhile. Rest in peace, Mr. Weaver, Earl of Baltimore. Thanks for giving us Orioles baseball. 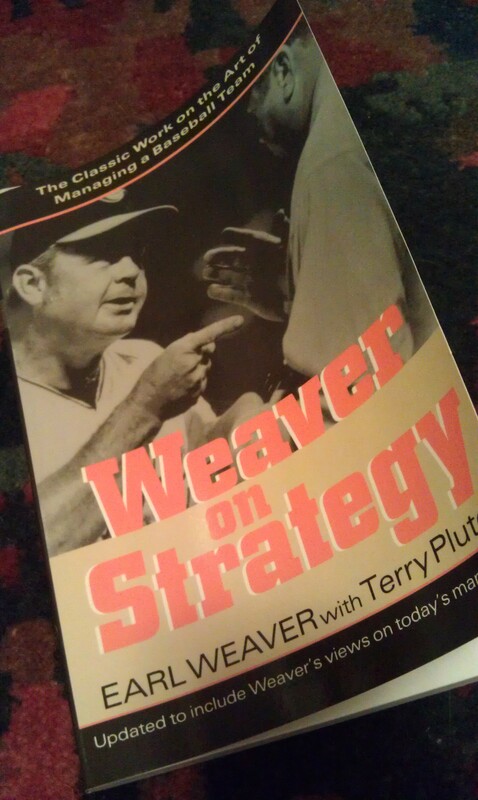 My dog-earred copy of Weaver on Strategy (1984, updated in 2002, and still in print) is always close at hand during the season. This entry was posted in Baltimore Orioles, Baseball, Baseball History, Life, Mom & Dad and tagged Earl Weaver, Mickey Rooney by Jackie, The Baseball Bloggess. Bookmark the permalink. When I saw that Earl had died, I just knew you would do a piece on him. Great job! Sorry about Earl. may he RIP. I love watching clips of him. I love the gritty side of baseball, he was a master at this. When I was a kid, Mickey Hatcher was one of my favorite players on the Dodgers. He wasn’t all that good, but he was fired up all the time and had a knack for a clutch hit or the right thing to say. So when I was a teenager, I saw him managing a Single A club in the minors. My family had just randomly gone to the game and I saw he was there. He got in a fight with the home plate umpire, started dropping F-bombs all over, where every kid in the park could hear it, and afterwards he signed my ticket stub. One of the greatest nights of my life. Earl was a Saint to Orioles fans. it’s almost Spring Training!